"Terra" in Latin means "The Land". The Terra is now 50 acres of Pinot Noir Vines. The first 32 acres were planted in 2002 to Dijon Clones 115 and 777. In 2012 and 2013, the remaining 18 acres were planted to Clones 943, 97 and Field Blend. Terra de Promissio has an ideal terrior for pinot noir grapes. The soil, southwest sun exposure, hill elevation, vine density and the wind and fog of the Petaluma Gap allow the Terra de Promissio grapes to have a slow maturation, extended hang time—which allows optimum ripeness- ideal conditions for the pinot noir grape and part of the formula for quality that results in intensely flavored grapes that makes exceptional and age-worthy wines ." "Since day one, every row and block is custom farmed per each of the winemakers specific instructions. Throughout the growing season, each of our winemakers make multiple visits to the vineyard to their designated rows as we work by hand to prune, sucker, train the vines as well as hoe, do leaf removal, green fruit removal and finally to harvest. We treat each vine individually ensuring that they have the ability to consistently produce fruit possessing a balance of sugars, acidity, and physiological ripeness. During the summer, to achieve the results that we and the winemakers desire, we also drop fruit. Even though the Dijion clones we grow produce smaller berries and clusters, we go thru the vineyard and cut green fruit to keep yields low to achieve fruit intensity. The results of a “lighten crop load” allows the vineyard to produce superior pinot noir. This collaborative effort ensures the best possible fruit for the wineries and the results speak for themselves." At Terra de Promissio, we always harvest at night. The winemakers like their fruit cold. The picks usually begin at midnight and go all night to dawn. For our wineries, we not only custom farm to their specifications, but we also pick when they want their fruit. Some wineries want to pick at low sugars--a more Burgundian style. Others pick with high sugars or a more fruit forward style. Regardless of the winery or how much fruit they get, every cluster of the entire vineyard goes thru a family members hands. 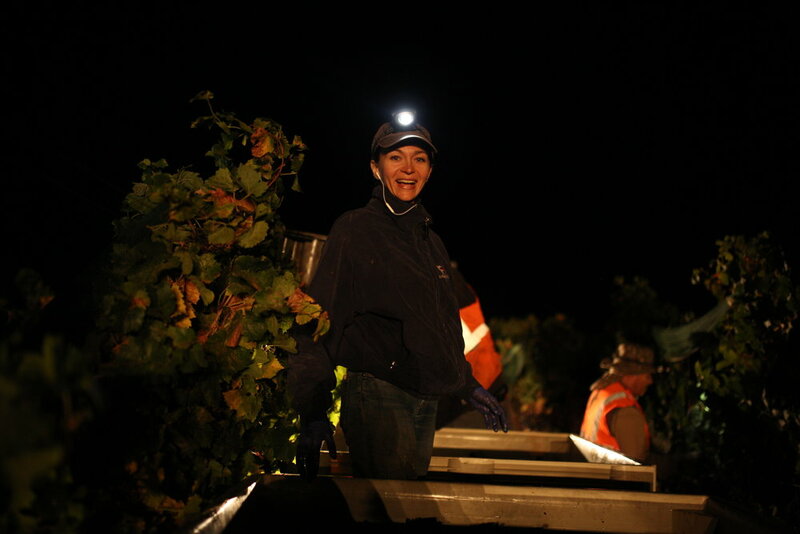 Diana (pictured below), her sister Alina and Diana's Mom are all on the back of the tractors--on the bins--every night of the pick. If a cluster does not meet our family's standards, it is removed immediately from the bins. Charles does the final check at the staging area helps load the grapes on the trucks and takes them to the winery. In 2017, the harvest was for 15 wineries over 16 nights during a 32 day span. We could not do this without a great team behind us, from the winemakers to our workers. We are very blessed to have a great crew and we can not thank them enough. The sparkling harvest is very special as it has become a family affair where all four of us can participate. Every year, we pick the 1 acre closest to the barn just for sparking wines. The harvest begins in mid August--a few weeks before the main harvest for the still pinot noir wines and before school starts for the kids. We begin at dawn and as it is a short pick, it takes only a few hours to get the grapes we need. As you can see from the pictures, Christian and Grace are a big help in picking, carrying and sorting the grapes. On January 14, 2014, the Sonoma County Winegrowers (SCW), announced that Sonoma County is committed to becoming the first 100% sustainable wine region in the world. Sonoma County’s wine industry has long been at the forefront of creating and utilizing sustainable practices in the vineyard, in the winery and in running their businesses. This expertise has now evolved into Sonoma County winegrowers and winemakers partnering together to establish the nation’s first 100% sustainable county which will benefit the environment while meeting the needs of consumers as well as increasing efficiencies, eliminating waste and saving money. Charles was part of the Sonoma County Winegrowers Board of Directors when this was initiative was created and unanimously voted on. "Since Day 1 at Terra de Promissio, we have employed sustainable farming practices that consider the entire ecosystem-vines, insects, other plant species, soil life, soil type, and our surrounding ecosystems-in order to minimize pests and diseases and create a healthy symbiotic relationship between our vines and the land." "At the vineyard, we have created a sustainable system by planting different plant species in the vineyard rows or cover cropping. In addition to providing habitat for beneficial insects, cover cropping also minimizes erosion by eliminating the need for cultivation and increases soil health as the crops' vegetal matter puts nutrients back into the soil." "In keeping with our commitment to of sustainable practices, Diana's father Vadim has built by hand 4 raptor roosts and 10 owl boxes on our vineyard. They are all occupied and we have 24/7 help in controlling gophers and moles in an eco-friendly way." Sustainability is complex, but the results are simple - the land stays preserved in agriculture, people are trained, safe and treated with respect and the business endures. "We at Terra de Promissio are proud to partner with the Sonoma County wine industry to become the world's first 100% sustainable wine region." "In addition to employing sustainable farming practices in the vineyard, at Terra de Promissio, we also farm our own vegetables, fruit and olives for our own personal consumption and for our guests who visit us. During the year, we grow zucchini, tomatoes, peppers, garlic, parsley, beats, onions, cucumbers, eggplants and pumpkins. We also grow olives trees that are harvested in November that are then made into olive oil. " We at Terra de Promissio have partnered with Sonoma County Wildlife Rescue. Sonoma County Wildlife Rescue is dedicated to the rescue, rehabilitation and release of sick, injured and orphaned wildlife. Sonoma County Wildlife Rescue helps about 2,000 animals a year and it strives to give each animal the quality care it deserves. Sick, injured and orphaned wildlife receive medical care and a place to recover before being returned to their natural habitat.